SkyCiv Structural 3D Enterprise is covered by the Novedge Best Price Guarantee. SkyCiv Structural 3D Enterprise 1-Year Subscription is a full 3D structural analysis and design software that allows you and your Team to analyze shear, bending, deflection, stress and much more. Build your model and analyze your structure faster than ever. SkyCiv Structural 3D Enterprise is completely cloud based. This allows users to access their programs and files from a web browser, from anywhere, anytime! No need to install or update the program. This is a cost effective solution with no further costs such as maintenance or updates. 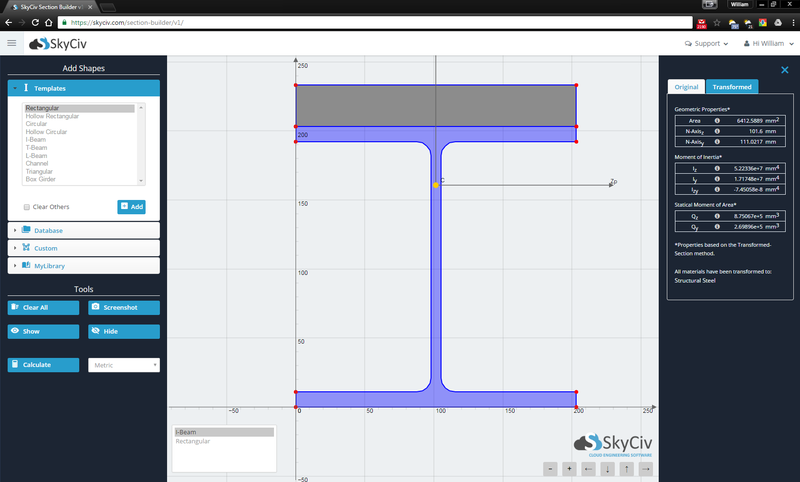 Different from traditional software that are clunky and difficult to use, SkyCiv is by far the most intuitive and easy-to-use structural engineering software for civil and structural engineers. Save thousands of dollars in expensive installation and ongoing maintenance. Flexible pricing, pay for what you need. Speed up your modelling with easy-to-use features. Model your structure faster and easier. Share and collaborate on models with your team in real-time, easily control user permissions and access, and more. SkyCiv Structural 3D is a full-featured structural analysis software - including beams, plates and cables. Visualize your structure with our powerful 3D Renderer. See how the structure will look (and deflect) in real life! Use in your reports or inspect the geometry of the structure with this bonus feature! 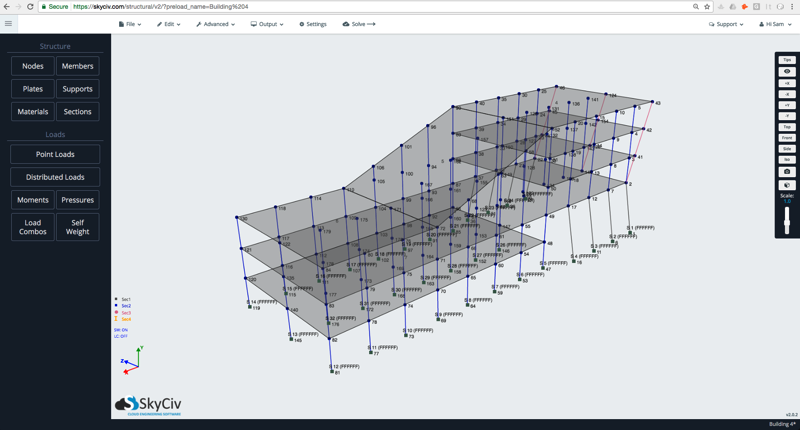 Rotate around and see your 3D model from every angle for the full structural analysis experience. Also view all results among the members using the color contours. Speed up your modelling in SkyCiv's structural analysis software, with these easy to use features that allow you to model your structure much faster and easier. 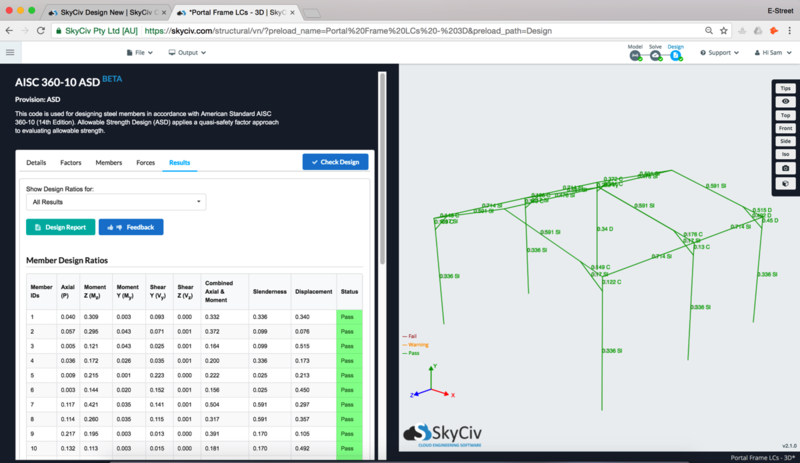 SkyCiv S3D allows you to custom build your own analysis reports in PDF format, as well as output full calculation reports from within our design modules. SkyCiv is powerful structural analysis software - supporting a wide range of elements. SkyCiv Beam -Access to the full SkyCiv Beam - including unlimited loads, hand calculations, supports, section databases, rendering, PDF reporting and full Stress results. SkyCiv Structural 3D - Access to the full version of SkyCiv Structural 3D - includes unlimited loads, supports, section databases, rendering, PDF reporting and full Stress results. Integrated Section Builder - Full inclusive Section Builder, including section libraries, composite shapes, built up shapes, save/load sections, hand calculations and full FEA solving. 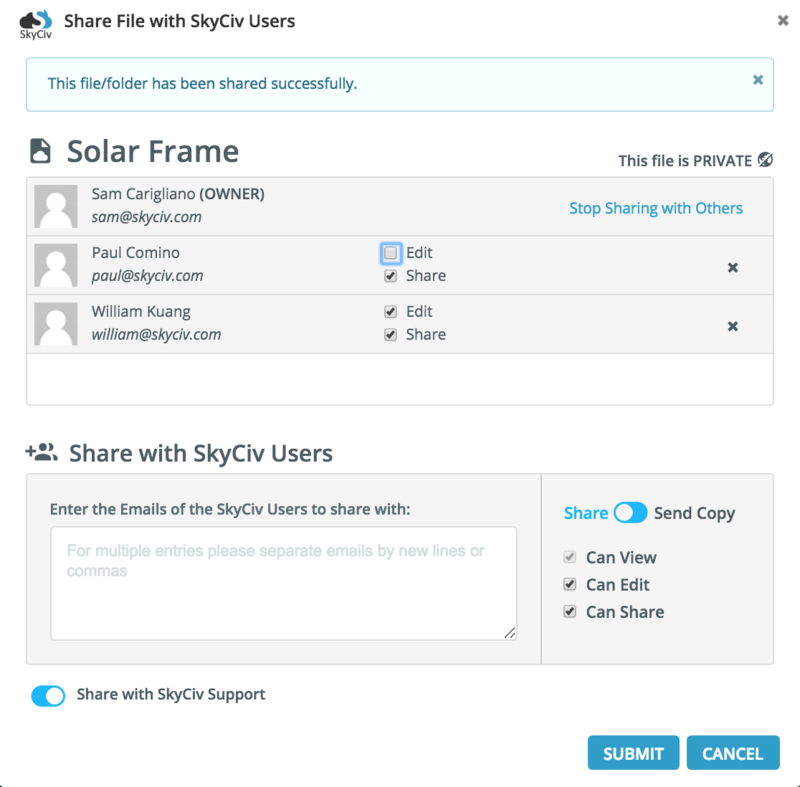 Full Standalone Design - Unlock the full features of SkyCiv Standalone Design software. Includes removed free watermarks and added functionality. Removed Watermark - Student and Not for Commercial Use watermarks are removed from reporting and software screenshots. Private Files -Your projects will not be displayed in the Public User Files folder. Your files are kept private and only visible by you. Custom Logo - Your logo at the top of all reports. Market your company and generate professional PDF reports. Engineering Support - Priority Support is provided to Professional Account holders - including support from qualified engineers to help you with your model, projects and software. Steel Member Design - Integrated Design check software with Structural 3D. Includes AISC 360, Eurocode 3, CSA 16 and AS 4100 steel check software and NDS Wood Design. Reinforced Concrete - Includes integrated concrete check software for the analysis, design and detailing of your concrete members. Includes ACI 318, AS 3600 and EN2. Connection Design - Standalone and Integrated AISC 360 Connection Design Software with 3D Rendering, full calculation reports and drawings. More coming soon.. - [Free for 12 Months] Automatically get instant access to any additional design and Add-ons released by SkyCiv. Including additional modules for member, concrete, connections, wind and foundations.